"A presentation stand that holds all your audiovisual equipment — notebook computers, LCD projectors, document cameras, visualizers and more. 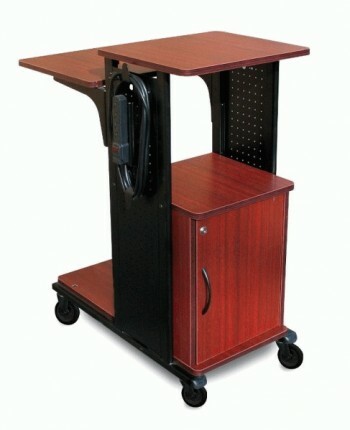 This mobile computer cart boasts 4 convenient worksurfaces. The larger shelves will hold most bestselling document cameras. The Adjustable second shelf raises flush with the top shelf or lowers up to 24"" beneath the top shelf to create your perfect working height on this multifunction AV cart. This attractive multimedia cart has sturdy, steel sides with laminate shelves. This mobile cart has four 3"" furniture casters (2 locking). Backed by the manufacturer's limited lifetime warranty. •Second shelf adjusts in 2” increments flush with top shelf or lowered 24”. •3-Outlet UL approved electrical assembly with 15 ft. cord, and cord management wrap. •3” stem casters ensure mobility. Two casters are lockable. •38 1/2”H x 18 1/4”W x 34 1/2”D.